Current industry trends show faster than average growth in the accounting field as new regulations and tighter lending standards increase the importance of financial audits. Xavier's newest graduate business program is helping to fill those positions as it is designed to prepare students for careers as outstanding and ethical professional accountants. A current resume documenting work experience; the resume is uploaded to the application system. Official GMAT test scores sent directly from the testing agency. 3 recommendations, requested and submitted through the application system. * Students applying before completion of their undergraduate degree should submit an official transcript that includes all coursework to-date. A final transcript must be submitted after graduation, and before the beginning of the second MACC semester. Xavier University is a mid-sized Jesuit, Roman Catholic university in the city of Cincinnati in the state of Ohio in the mid-western United States. Approximately 3% of our graduate student population is international, representing countries such as Japan, France, Taiwan, Senegal, China, Russia, Saudi Arabia, Spain, England, and India. Admission for International MACC students needing an F-1 visa requires the following. Students needing an F-1 visa must be fully admitted to enroll in the program. 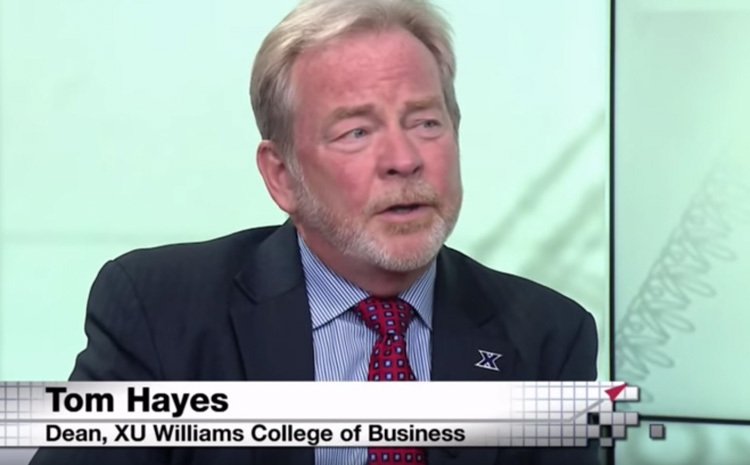 Xavier does not offer conditional admission to graduate business programs. Check your application status page for updates to your application and to see your decision letter. Your application will be considered once all materials have been received. If you have not heard from us within two weeks of submitting your final item, please feel free to contact us. Once you have received an admission letter, proceed to Step 4. In order to provide you with an I20, you must submit the following materials. For full details on these requirements, please visit the Xavier International Admission website. * English competency exam requirement can be waived if you have received a previous degree in the United States or have worked in the United States for at least 5 years. Curriculum requirements for the Master of Science in Accountancy vary based on a student's academic background. In general, a student with an accounting undergraduate degree will complete 30 credit hours; a student with a non-accounting business major will complete 33 and 42 credit hours. Before entering the program every student will meet with the Program director to determine his or her needs and create a plan for completing requirements. These courses are required for students who do not have an undergraduate degree in business or did not take equivalent courses at the undergraduate level. These courses are taken with MBA students. These courses form the basis of knowledge on which the remainder of the degree will build. Students who are new to accounting may need to pursue additional non-credit preparation. These courses are required for all students who have not previously completed equivalent courses at the undergraduate level. All students will complete five general electives. These electives will depend on the student's undergraduate major and whether the student elects a concentration. Electives are chosen in consultation with the M.S Program director. Those with non-business degrees will complete 1 Accounting elective only. These electives are taken through the MBA program. This list is not comprehensive. Other electives may be approved by MACC faculty. Students without undergraduate accounting degrees will complete these courses for additional accounting experience. Nonprofit & Governmental Accounting (MACC 515): - This course is designed to introduce students to financial reporting for governmental entities at the municipal, state and federal levels as well as nonprofit organizations. Auditing Concepts & Practices (MACC 590): - This course examines the integrated audit process from the perspectives of standards, audit planning, internal controls, ethics and the application of sound judgment in the decision making process. Corporate Income Tax Reporting & Compliance (MACC 611): - This course introduces students to issues related to federal income tax planning and compliance and financial reporting for C-corporations. Fraud Examination (MACC 622): - This course is designed to enhance a student's understanding of the emerging field of fraud examination and forensic accounting. The course is intended for those interested in new and emerging areas of accounting. Current Topics in Accounting Practice (MACC 625): - This course examines current developments in accounting practice. Students will learn to identify current trends, changes, problems and other events or issues, to understand them in their theoretical and historical context, and to understand the development of accounting standards and practices. Advanced Financial Accounting (MACC 631): - This course is designed to enhance a student's understanding of the theory and practice of financial accounting. Topics include mergers and acquisitions, consolidated financial statements, foreign currency transactions and partnership accounting. Be prepared to sit for the CPA exam, the CMA exam, or other professional certifications. Connect with more than 18,000 Xavier alumni with graduate business degrees. Xavier's Jesuit identity encourages students to approach business with a strong ethical foundation. Xavier is listed among the Best Business Schools by The Princeton Review and its part-time MBA is consistently ranked among the 100 Best by US News & World Report and BloombergBusinessweek. The MACC program is open to all students with an interest in the accounting field, regardless of their undergraduate major. Graduates become competent in the primary functional areas of accountancy: financial accounting, managerial accounting, audit, taxation and accounting information systems. PER CREDIT HOUR, THE MS IN ACCOUNTANCY IS REASONABLY PRICED COMPARED TO LOCAL AND NATIONAL COMPETITORS. ALLOW FULL-TIME OR PART-TIME STUDENTS TO KEEP THEIR DAY JOBS. FULL-TIME STUDENTS CAN FINISH IN ONE YEAR. START ANY TIME–SPRING, SUMMER OR FALL SEMESTERS. Kenny McNutt appreciates things that are organically grown - the cows on his father's farm, home-brewed beer, the camaraderie of good friends. It all added up to his decision to quit his job as an electrical engineer and open MadTree Brewing. Yvette Simpson, lawyer and Cincinnati City Councilwoman, on how Xavier's Executive MBA program helped her become a better leader. Your financial needs are integral to selecting the right graduate program. It's important to explore all possible avenues to assist you in this endeavor.